Do you have the feeling that your hair always looks a mess? Here is all you need to know to get rid of the tangles. Why does hair become tangled? There are two main reasons for tangles that keep reappearing. Tangles appear either because you have long hair and / or because your hair is fine, in which case the strands twist themselves together with each movement. Or perhaps because your hair is sun-damaged. 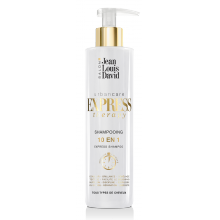 Dry and porous hair then takes on the well-known 'fluffy' look: it forms frizz that quickly turns into tangles. How do you say goodbye to tangles? Yes! If you have long hair, head to your hairdresser's for a trim of the ends and a leave-in haircare treatment. This will allow your locks to stay smoother and less prone to getting tangled. Ideally you should do so on a regular basis. If your lengths are damaged, the priority should be to repair your hair. Go for repair shampoos and masks as well as detangling products. They act in synergy to moisturise your locks, smooth the hair fibre and build up strength to prevent those tangles. In addition to haircare products, get yourself into the right habits. This starts with regular brushing that eliminates the first sign of tangles forming and prevents them from developing any further. Also, don't forget to tie your hair up to avoid tangles caused by the rubbing of your strands against clothes, the pillow or your shoulders, if your hair is long. A simple braid is enough to say goodbye to them. Some habits should also be banished from your hair care regime. Stop rubbing your locks with a towel after shampooing and drying your hair in all directions with the hair dryer, as these habits promote knots!